In the Innovation Economy, several factors come together to drive economic growth: knowledge, technology, entrepreneurship, innovation and collaboration. In working toward these goals, TechConnect has identified the “hockey stick” of innovation in West Virginia. Starting in the north in Morgantown and running south along I-79 to Charleston, then tacking west along 1-64 to Huntington, the outline of this region roughly resembles a hockey stick, as evidenced on the accompanying map. While innovation can and does happen anywhere, TechConnect realizes that the assets contained in the “hockey stick” make it a prime location for innovation-based economic development to flourish. 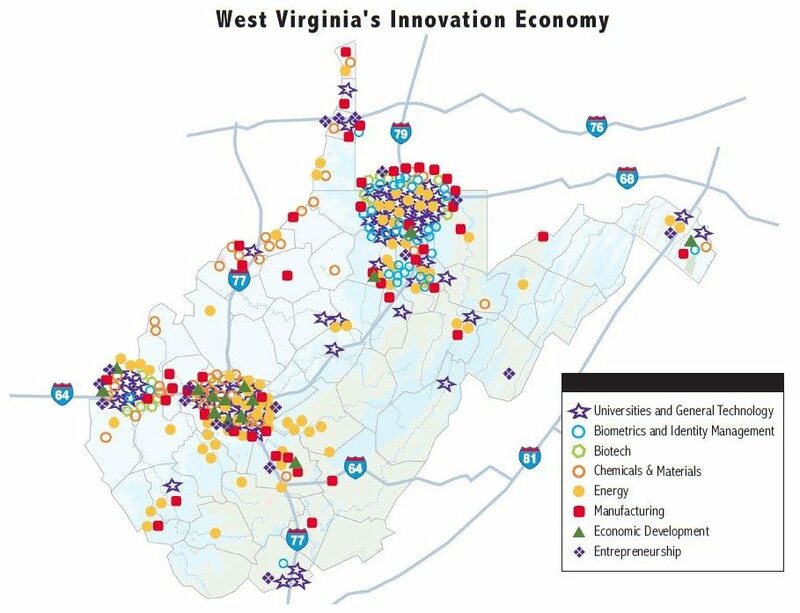 The map showing West Virginia’s Innovation Economy includes the state’s colleges and universities, technology parks, research laboratories, private sector firms, federal anchor facilities, economic development organizations, entrepreneurial resource providers, and sources of risk capital and investment. These entities are crucial to innovation-based growth and demonstrate cluster development. Center for Applied Research and Technology, Inc.
PCC Energy, Special Metals Corp.
Stowers & Sons Trucking, Inc.